You do everything to ensure your baby’s health during pregnancy: you eat right, avoid drugs, smoking and drinking, take childbirth classes so you can have a natural, drug-free birth. After the baby is born, you breastfeed knowing that is the superior form of nutrition; you do everything you can to make sure your baby is healthy —- but have you had the most important part of their health, their spine and nervous system, checked? Birth Trauma – The First Subluxation:”The birth process…is potentially a traumatic, crippling event…mechanical stress imposed by obstetrical manipulation. Even the application of standard orthodox procedures may prove intolerable to the fetus. The view has been expressed clinically that most signs of neonatal injury observed in the delivery room are neurological…” Towbin A., Latent spinal cord and brain stem injury in newborn infants. Develop. Med. Child Neurol., 1969. “With the birth process becoming more and more an intervening procedure….the chiropractic checkup becomes even more important to the child’s future.” Larry Webster, DC, of the International Chiropractic Pediatric Association. “Our children deserve to be treated naturally, not with dangerous chemical drugs and unproven surgeries” Bobby Doscher, DC, director of Oklahaven Children’s Center. Do all you can to give your baby the best possible chance to have a healthy life. That includes childbirth without trauma, avoidance of drugs and medical procedures, and breastfeeding. You have your baby’s eyes checked, heart checked, ears checked —- why not their spine and nervous system? Children are constantly putting stress on their spine and nerve systems. The average child by the age of 5 has 200 major falls; on the stairs, off their bicycle, out of a tree house or learning how to skate. Children spend many hours at their desks at school and carry backpacks with heavy textbooks. Many of them play sports, have additional falls, or sit in awkward positions while playing video games or using the computer. 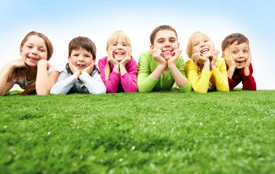 Click here to learn about some specific wellness topics for children.